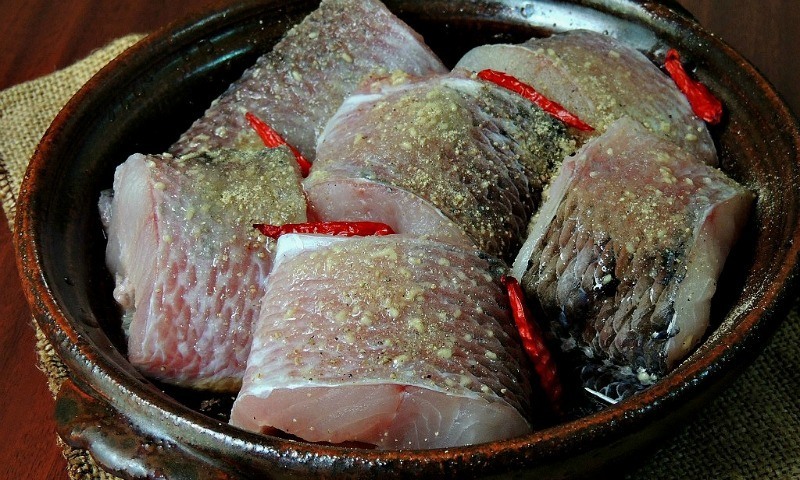 This is one of the most traditional dishes in Vietnam, particularly in the southern areas of Vietnam because the fish and meat are plentiful in there. 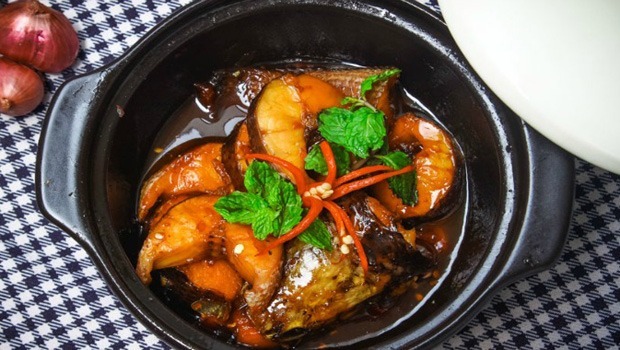 Cá Kho Tộ – Vietnamese Caramelized And Braised Catfish is originally served in the clay pot, but not everyone has clay pots, so you can use a skillet as a replacement. 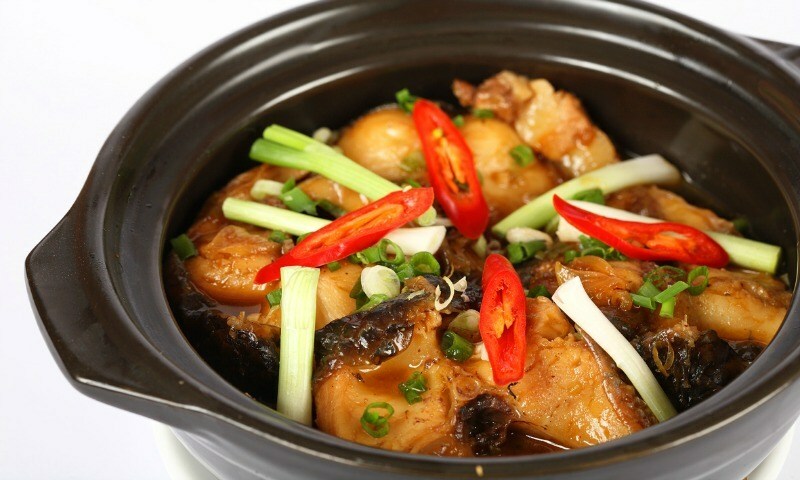 The tasty catfish simmered in a caramelized sauce with green onions, fish sauce, garlic, and red chilies. Trust me, you will be so glad to find such a simple recipe you can make at home! Let’s take a look at this detailed Vietnamese Caramelized And Braised Catfish – Cá Kho Tộ recipe! 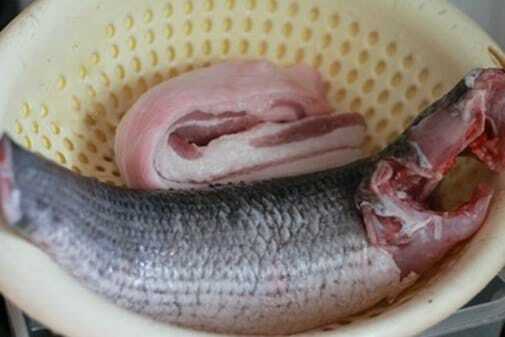 Prep the catfish: make sure that the fish steaks have the skin on. Use paper towels to pat dry. In a large skillet, pour 1/3 cup of white sugar and 1/3 cup of water, boil it over medium heat. Try to stir them occasionally till the sugar gets deep golden brown (like the color of cockroach’s wings). It is important to watch the sugar. Do not let the sugar get dark brown or you will receive a burnt taste. 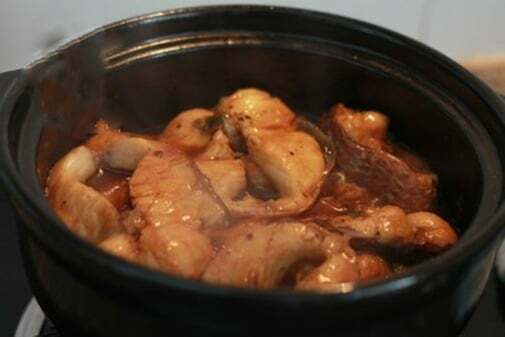 Remove from the heat, stop for a minute before adding the fish sauce into and stir well using a wooden spoon. There, you have made caramel. Next, add the prepared catfish steaks to the caramel, followed by red chilies, shallots, green onions, minced garlic, and white sugar. Then, add water just enough to cover the fish. Bring it to a boil, after boiling, you lower to simmer for 45 minutes to 1 hour. Stir occasionally and add more water if necessary. After the water gets evaporated, you can check the fish to see if it is fully cooked or not. If not, add another 1/3 cup of water into and cook for some more minutes to let it cooked fully. The gravy with caramel color should be thick. Then, season the dish with fish sauce plus with black pepper and cook for extra 5 to 10 minutes under low heat. Garnish your dish with cilantro leaves (or parsley as an alternative). Once done, Vietnamese Caramelized And Braised Catfish is really tender. This Cá Kho Tộ – Vietnamese Caramelized And Braised Catfish dish is perfectly delicious when served with jasmine rice. You will surely love to spoon the thick sweet/salty sauce over the rice. But, upon cooking, you may want to turn on the kitchen fan because this dish’s aroma could be a little bit strong.